Date: Friday 16th February 2018. Venue: The Oxford and City & County Bowls Club, Marston Ferry Link Road, Oxford. Attendees: Colin Barson (CB), Matt Cavill (MC), Jem Faulkner (JF), Simon Bradbury (SB), Trevor Lambert (TL), Ali Wolfe (AW), Michael North (MN), Graham Butler (GB). Apologies: Jemma Hayward (JH), Maurice Earp (ME). Actions from the minutes of the last meeting(s) in 2017 and the members meeting on Wednesday 10th January 2018. The minutes of the last meetings were agreed with no outstanding actions. (a) It was reported that The Trust bank account remains in a healthy state with over £10,000 in available funds. There is a draw down to be completed from PayPal (memberships) which will increase the funds and this will be carried out by the end of February. (b) It was reported that all fees to Supporters Direct and The FSA (£65.00) have been paid and all accounts are up to date. (c) GB confirmed that Terry Winter is now in possession of all cheque/payment details as well as the receipts from memberships. Terry will be finalising the Trust’s annual financial accounts by the end of March. These will be issued to members at the AGM. (a) TL took those present through the latest membership details. We now have 986 members, which is up from the 955 at the end of the year. (b) It is pleasing to note that membership continues to grow and that the 1000 mark should be achieved soon!! (c) Twitter and Yellows Forum continue to be important communication media for OxVox, but Facebook is proving less so. (d) TL confirmed that the OxVox web site is up to date with all the latest communications. (e) TL confirmed that we are now trialling ‘MailChimp’ for member communications. This follows issues we have had with members not receiving emails from the old system. Early signs are that there is an improvement, but this will be monitored closely and discussed again at the next meeting. (a) Those present discussed recent meetings and communications with Darryl Eales, which had centred on takeover speculation. (b) It was resolved, that if a takeover did/or did not take place, that in either event, notes from a meeting held with Darryl and a potential purchaser would be released to members. (c) Darryl Eales has committed to keeping the Trust informed and JF confirmed that there is now an open communication channel with a prospective purchaser. (d) Confidentiality remains in place for the time being. It was acknowledged by all that this had been a frustrating and difficult time for the committee and of course for members, but it was hoped things would be resolved soon. (a) JF relayed recent conversations that he has had with Firoz Kassam. (b) FK is still of a mind to not move forward with any meaningful way with a change to the stadium ownership and/or lease/license arrangements, until such time as the ownership of the club is clear and the arbitration issues are resolved. (c) JF is looking to meet with FK in mid-March. The date is still to be confirmed. (d) The committee are also seeking a meeting with the (new) leader of Oxford City Council. This is viewed as very important. JF will set up the meeting. (e) Following recent meetings with Cherwell DC, Oxfordshire County Council and Oxford City Council, it had been confirmed that Water Eaton is not a realistic option for any potential re-location of stadium. These meetings confirmed what had been communicated to members over a year ago. (f) The meeting discussed the recent members meeting (10th January) at which ‘stadium’ was a major topic for the 100 members who attended. Further follow up meetings with all the local councils, and key officers, are planned for the coming months to discuss options. (g) The meeting discussed the news, as previously communicated to members, that a new rail line and station is now likely, with the new station located adjacent to the Science Park. The rail line already exists, but work will be required to bring it up to standard for passengers. (h) It was confirmed at the meeting that OxVox will meet with Chiltern Railways in early April to discuss how the line will operate and the opportunities for use by OUFC fans on match days. (i) In conjunction with significant new housing (which is still subject to planning review and therefore confirmation) on the other side of Grenoble Road, it is felt that the rail line would provide significant opportunities for OUFC and its fans in terms of travel and access. 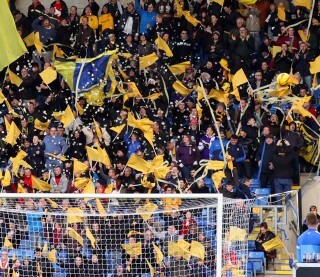 (j) Given that a more equitable solution can be found, the committee are still of the belief that Grenoble Road can be a long term and successful home for OUFC. (a) AW talked the meeting through a project to install a full width mural at the back of the East Stand. (b) This it was felt would add much needed colour to the stadium. The mural would be a collection of pictures of great moments in OUFC history, as well as fan ‘scenes’. The Yellow Army have been consulted and will be partners in the project. AW committed to also discuss the project with the Ultras. (c) The installation of the mural has been agreed by Firoz Kassam and the club. (d) It is proposed to create a list of available pictures that fans can vote on for inclusion. The total cost of the mural will not exceed £3,000 and sponsorship will be sought to meet the cost. The details will be communicated to the entire fan base via twitter and the local media by the end of March at the very latest. (e) The meeting discussed the Priory Pub. FK has offered it to OxVox, but the committee felt it is not commercially viable to take this on. It will however be discussed at a meeting with the club in March. (f) SB and TL confirmed that they are close to finalising the renewed Community Right to Bid (CRTB). (a) The meeting discussed preparations for the AGM. (b) The AGM will take place on April the 28th 2018 at 12.15pm. The venue will be the Kassam Stadium. (c) The meeting discussed the future make-up of the OxVox committee following the AGM. (d) CB, MC, TL, AW, MN, ME, JH confirmed that they wished to stay on as committee members following the AGM. (e) JF, SB and GB confirmed that they would not be seeking re-election and would be standing down at the AGM. JF had already privately indicated to the committee his intention to stand down back in September. (f) TL will be preparing the relevant papers regarding the AGM and these will be sent out, via email, to members in early March. (g) With 3 vacancies, it will obviously be important to attract new committee members and the meeting resolved to actively seek out members who may be interested in putting themselves forward. If there are more applicants than spaces, then an election will be held and members will vote. (h) Once the new committee is formed, this will quickly be followed by the new committee holding a meeting and electing a new Chair and Vice Chair. (i) The next committee meeting (end of March) will discuss in more detail the ideal hand over periods and jobs requiring completion from those leaving and the allocation of any new responsibilities and roles where they are needed. (j) JF said he would personally write to members ahead of the AGM. (a) JF confirmed that he is attending a SAG (safety advisory group) meeting at the stadium on the 22nd February. (b) It was confirmed that the club is actively engaging with OxVox on season ticket pricing for next season. A meeting with club is being organised, but recommendations will be sent in advance. OxVox will be recommending that there should not be any increases to either season or match day pricing and that ‘offers’ are put in place around ticketing. (c) OxVox are speaking with the club about a pre-season tour. No details have been received as yet. (d) WSL (OUFC Ladies) was discussed and OxVox is seeking clarification on funding for the current season. (e) It was noted that the club shop in the covered market is not always open when it should be. OxVox have informed the club about this. (f) A fans forum is planned for 1st March, but needs to be confirmed. JF will pick this up. (g) It is now understood that the training ground issue has been resolved and will be announced by the club soon. Details will be in the media/club sites, but OxVox will ask for information for members. (h) It was resolved to support the upcoming Les Robinson testimonial dinner with social media support. (i) It was noted that there had been a campaign to support and provide funds for Paul Moody. JF has written to Darryl Eales about this and various committee members have also made personal contributions to the fund. (j) It was agreed to support Oxford City Stars Ice Hockey team in their ‘advertising’ of the upcoming match against Swindon! A ticket deal (reduced price) has been agreed for OxVox members. There was no other business to discuss & the meeting ended at 9.45pm. All those present thanked the Bowls Club for their hospitality.